Anwar al Awlaki's rise from American-born cleric to key terror plotter had put him atop the U.S. terror "hit list." 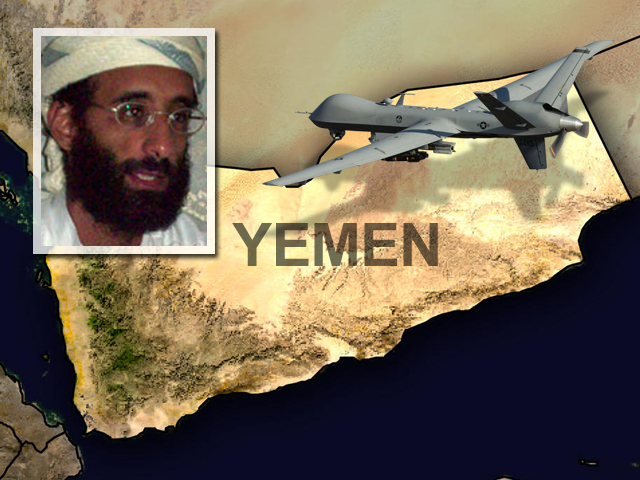 Under the code name Objective Troy, intelligence tracked Awlaki for months near his hideout in Yemen. Early Friday, a CIA drone found its target. The Washington Post reports that a secret Justice Department memo sanctioned the killing of Awlaki, a U.S. citizen who became an al Qaeda propagandist and operational leader. The document followed a review by senior administration lawyers of the legal issues raised by the lethal targeting of a U.S. citizen. Administration officials told the Post that there was no dissent about the legality of the killing. The administration has faced criticism - and a legal challenge - over its targeting of Awlaki, who was born in New Mexico to Yemeni parents. The memorandum may represent an attempt to resolve a legal debate over whether a U.S. president can order the killing of American citizens. With regard to the killing as a counter-terrorism measure, the memo deems, in the words of one officials, "due process in war." "The administration has tried to make very clear that this was an act of self-defense, that Awlaki was part of not only al Qaeda in the Arabian Peninsula, the al Qaeda affiliate in Yemen, but he was the external operations chief. He was ongoing in his plotting against American citizens - not only having done so in the past, but continuing to do so in an imminent way," said CBS News national security analyst Juan Zarate. "So based on the rules of self-defense, based on the principles that we're at war with al Qaeda and the fact that he was a part of the group, self-professed, all of that suggests that it's lawful and appropriate to go after him and to kill him," Zarate said. When asked if the drone attack against a U.S. citizen - in effect, execution without trial - sets a precedent, Zarate said, "It's a good question - you run the risk of a slippery slope here. I think people are asking very appropriate questions about what the limits of the government's power can be in terms of going after Americans who are part of al Qaeda, and we've seen in the recent past that Americans have formed more and more part of the al Qaeda network - not just Anwar al-Awlaki, but others. There are important questions to ask about what the process is and what the procedures are to determine who is an imminent danger to the United States." Over the past two years, Awlaki had been connected to three attacks against America. Officials say his emails inspired accused Fort Hood gunman Major Nidal Hasan. Awlaki helped plan the failed Underwear bomb attack, and was part of the plot to bring down cargo planes with explosives inside computer printers. "Awlaki was the leader of external operations for al Qaeda in the Arabian Peninsula," said President Obama. "In that role he took the lead in planning and directing efforts to murder innocent Americans." But it was Awlaki's command of English, and his understanding of American culture, that made him al Qaeda's most effective recruiter of homegrown radicals inside the U.S.
"This religion is about your willingness to sacrifice for Allah," Awlaki said in one video. He offered a unique terror "talent," which al Qaeda may be hard-pressed to replace, said CBS News Homeland Security correspondent Bob Orr. Also killed in the strike was another American. Samir Khan, from North Carolina, was the chief propagandist for Awlaki's terror group, and published the online jihadist newsletter Inspire; and the top al Qaeda bombmaker in Yemen, the Saudi Ibrahim al-Asiri. Appearing on "The Early Show on Saturday Morning," Zarate was asked who might be waiting in the wings to replace Awlaki? "I don't think he is replaceable immediately. He was the 'pied piper' for Western recruits," he said. "He was somebody who could speak to Western ears. I don't think he is replaceable in the near-term." Zarate also warned of retaliatory strikes: "Awlaki inspired numerous individuals. He was radicalizing via his online videos and sermons, so he has a following, and there may be retaliation."